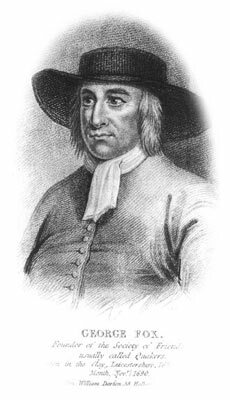 George Fox (1624-1691) was born in Leicestershire, England. As a young man he became disillusioned with the religious life of his time. He found many other “seekers” who also felt the churches had become bogged down with traditions, rituals and power politics, and together they tried to lead a renewal of Christianity and live out the Christian message more simply. In due course they called themselves The Religious Society of Friends. Many suffered persecution and imprisonment for their beliefs. “Quaker” was a nick name which stuck, and now we are known as Friends or Quakers. The first recorded Friends Meetings for Worship in Ireland were held in 1654 at the home of William Edmundson in Lurgan, Co. Armagh. There are about 1,600 members in Ireland, and about 340,000 worldwide. Our Meetings for Worship are central to the life of Friends. These are public meetings – anyone who wishes to attend is welcome. They are normally held in a meeting room in a Quaker Meeting House on a Sunday, but can be held at any time and any place and are based on quiet worship, and communion with God and with each other. Anyone present who feels moved to do so may speak, pray aloud, or read from the Bible or other writings. The special quality of Quaker worship depends on the prayerful participation of everyone present. Since we have no paid ministers, every member undertakes responsibilities according to his or her abilities. Quakers have always put men and women on an equal footing. Quaker marriages and funerals take place during a Meeting for Worship arranged for that purpose. Decisions in our meetings for Church Affairs are made by discerning the “sense” or “feeling” of the meeting and not by voting. Friends regard the whole of life as a sacrament, and Meeting for Worship itself as a form of communion. Our conviction that there is “that of God” or “the light of Christ” in everyone has its origin in what Jesus taught, and the way He lived. In outward matters we aim at simplicity and integrity. From the beginning Friends have opposed all war as inconsistent with the spirit and teaching of Christ. We try to avoid conflict in our daily lives and work towards reconciliation and relief of suffering. We do not claim that ours is the only path to God, but simply that it is the right way for us.